STIGA or it's official name "STIGA Sports AB" is a Swedish company that specializes in making table tennis equipment. They've been in the business since 1944 and are a worldwide leader in a recreational as well as tournament-quality ping pong equipment. Being in business for over 70 years means that STIGA knows what they're doing, hey are a high-integrity company that stands behind their products and I would not hesitate to buy from them. 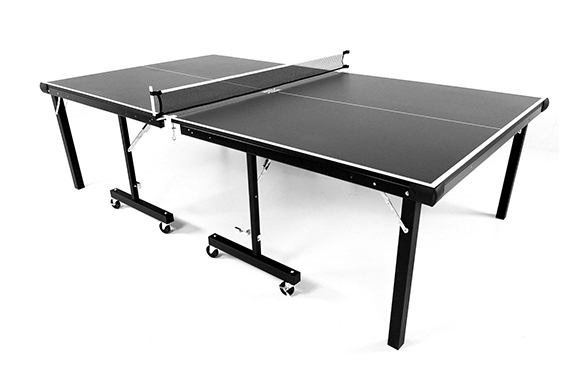 While they do make a variety of ping pong paddles, STIGA also offers a wide range of table tennis tables, from high-end competition level ITTF-certified tables to more affordable recreational tables. STIGA is the official sponsor of the Chinese and Swedish national table tennis teams who are the two dominant forces in the world of ping pong. This shows that STIGA is a company that is serious about ping pong. 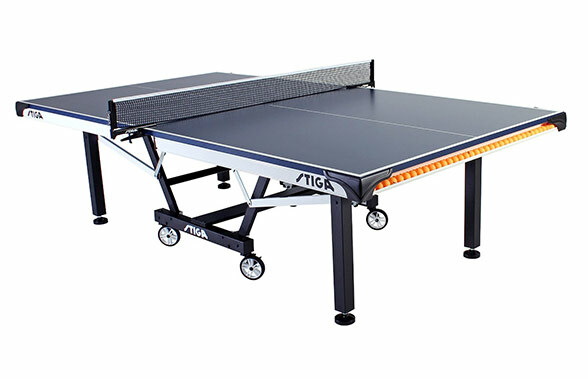 1” 3/4” 3/4" 5/8" 1/2"
You'll notice that more expensive STIGA table tennis tables have bigger wheels, thicker tops, sturdier frames and more extra features than the cheaper ones. This is a great thing about STIGA tables, they don't just offer a one option for recreational players and one for the competitive players. They offer a series of tables that, as they get more expensive, have more competitive, high-end features and materials giving players many more options between the very low recreational table price point and the extremely high competitive table price. This gives you many more choices in finding a table that suits your specific needs, no matter what your price point. The STIGA STS 420 is very popular because it's a solidly built indoor table with a thick 1-inch top that is actually quite affordable. Weighing over 300 pounds, this table has a solid frame featuring a 2.5" powder-coated steel apron, sturdy 2.5" steel legs with levelers and high-end 5" mag wheels with locking mechanisms. It offers near tournament quality performance with a 1-inch thick playing surface and extra cross braces to keep it stable. You'll notice that STIGA STS 420 also has some really nice extra features. The most obvious of these is the full-width integrated ball storage. There is room for up to 40 ping pong balls inside each end of this table so that balls are always accessible and easy to reach. This is something only STIGA offers and it's a huge convenience. You can see our full review here. More affordable than the 420, the STIGA STS 185 table is a lower-tier ping pong table that is more lightweight, and therefore easier to maneuver than its heavier counterpart. However, the STIGA STS 185 still offers a great playing experience. It features a 3/4" thick table top with silk screen printed tournament lines, high quality 3" ball-bearing wheels, a 2-inch wide steel apron and 2-inch thick steel square legs. With much fewer parts than the 420, the STIGA STS 185 is much easier to assemble. It comes with what STIGA calls the "QuickPlay Chassis" which comes with many parts that come pre-assembled and packaged up for shipping. This chassis also features extra cross beams supports for extra stability between the table legs and the rest of the frame. It also features integrated ball storage that stretches half the width of the ends of each side of the table. You can see our full review here. 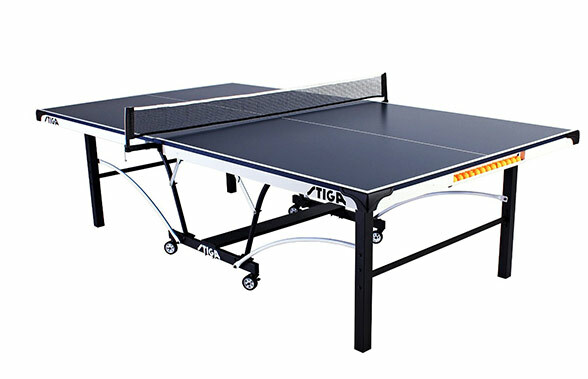 The STIGA Instaplay Table Tennis table is a simple, convenient and well-built recreational level table that offers a great playing experience at an affordable price. It offers a lot of conveniences in addition to a decent 3/4" thick table top with silk screen striping, 2" thick legs, 3" wheels and a 2" steel apron to keep the table top in place. What is most lacking from STIGA Instaplay is cross beam supports that keep the structure of the table intact. The two biggest conveniences of the STIGA Instaplay are the ease of assembly and storage. STIGA did a really good job of building a good ping pong table with an extremely simple construction using still high-quality components. The fact that this table comes shipped pre-assembled is a huge bonus. Many tables can take all day to assemble and then when they have to be moved or stored more permanently, this process has to be repeated again. The Instaplay ships pretty much entirely pre-assembled so that you can simply unfold it, attach the net, and start playing immediately. Also, the table is essentially two separate table halves so this makes it more versatile and also easier to store. You can see our full review here.